During 26-28 february took place at Chartre – less than 100 km from Paris a special Seminar of Traditional Martial Arts, organized from UNGDA (National Union of Aikigoshindo and Associate Disciplines from France), Shihan ROLAND MAROTEAUX – the president of European Sobukai Takeda Ryu and Sensei Serge CHARLOPEAU 5 Dan Takeda Ryu – the president UNGDA. The occasion of this special seminar and international reunion was the anniversary of 20 years from the foundation in France of UNGDA and also the granting of the 8th DAN to Sensei Maroteaux by the renowned international association IBA (International Budo Federation). To this special event there was invited it take part a lot of European experts and not only; even a series of surprise guests. The reunion has begun with an official dinner party with a special program, organized at the hotel Novotel from Chartre. The dinner party was presided by the Baron Andre Saumiere d’Alby – an old friend of Sensei Maroteaux, an enthusiast by that entire concern medieval cavalry and war ethic in Europe. There were introduce the honorary guests – the foreign experts, and, after festive speeches, Sensei Maroteaux was granted the 8 Dan Aikijutsu diploma, and also the international recognition with honorary title of Hanshi. The next days all the guests started to teach techniques specific of their schools or styles. Here are the list of the honorary guests - experts in many traditional martial arts, which attended at this seminar. He has presented many fight combinations specific to the Nihon Kenpo style, a variation of Kenpo Jujutsu initiated in Japan by Master Tanaka. The style contain many principles and articulator techniques in the manner of Aikijutsu, very strong projections and also atemi techniques – strikes with the arms and the legs. Apparently the style resemble enough with Shorinji Kenpo. It isn’t useless to be mentioned that Master B. Lalandre has followed in Japan also a lot of stages for perfecting in Ju Kenpo Takeda Ryu even with Soke Nakamura. The Master Doudou is the director of IMAF in France and he was the official of this renowned international organization to this stage. He has presented a lot of techniques of Kumite by traditional Shotokan, with accent on the subtleties bound the lack of balance manners of the opponent (Kuzushi). It was studied also a series of fight techniques at short distance with finalities from Nihon Jujutsu, discipline that master Doudou practiced too with Shihan Shizuya Sato – The Director of IMAF. Ex-trainer in the Foreign Legion, with over 20 years of experience as black belt, skilled stuntman and with a fine humor, Sensei Vignau has presented a lot of techniques for defense on the knife and fire weapons, immobilization with the belt or different improvised weapons. He practiced an old Shotokan, non-modified, with high postures and techniques for fighting both at the long distance and at the short (with elbow and knee techniques). International Technical Director for Judo and Jujutsu, master Tieleman has presented projection techniques and counter-proceedings and also techniques for forced transport. He has also insisted on the specific details, from vital importance in the combat with more opponents and he has also presented a series of details of some articulator techniques. Technical director in France for Shito Ryu, Master Bodet has presented 2 traditional kata of Okinawaian inspiration: Seisan and Hakutsuru (white crane kata) and also combinations for kumite. Technical European Director for International Budo Federation, Master Blanchet has presented Aikijutsu techniques performed with an uncommon flexibility and very dynamics. The accent has been laid here on sabaki techniques (shiftiness and dodges) that, good mastered, lead to techniques both very correct and very efficacious. Also he has presented a series of atemi principles (strikes), techniques of weapons and for fight against many opponents. Master Del Cueto, Cuban from origins but established in Canada, i s one of the few non-oriental which, after many years of study directly in Japan, has succeed to take the title of Menkyo Kaiden in Daito Ryu Aikijutsu (the total mastership in all the techniques of the school). For the first time, Master Del Cueto has presented in Europe the basic and advanced elements of Daito Ryu Aikijutsu. With an uncommon goodwill and with much calm, Master Del Cueto has wrought with everybody from those presents there, explaining himself the techniques and the principles. Daito Ryu is a school derived from Takeda Ryu in 16th century and she is the form from which Master Ueshiba has developed the modern AIKIDO, in the form known today. 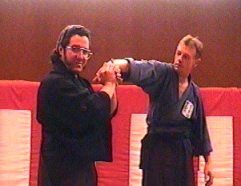 Master Del Cueto has explained both the external form and certain methods for the sewerage of the energy included in higher level of Daito Ryu without the technique being efficiently. More about another stage only from Daito Ryu, unfolded in Paris – in the next issue of our magazine. 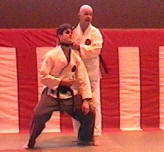 Finally Master Maroteaux has presented 2 demonstrations of Takeda Ryu Aikijutsu and Iaido – very appreciated. Sensei Laiber has took part to this stage in a double quality, representing both Romania and Germany whom officials couldn’t come. MAA Germany has empowered Sensei Laiber to represent also Germany and, on this way, it was offered to Sensei Maroteaux, the Honor Diploma of MAA. Finally I should wish to profit by this occasion to thanks to all the masters and teachers with whom I has been the pleasure and the honor to study, for the special kindness with whom they were met me and helped me to perceive better fine details of the traditional Budo: Shihan Roland J. Maroteaux, Sensei Pascal Lagouche (4 Dan Aikijutsu, 3 Dan Iaido, 1 Dan Jodo – Paris), Sensei Serge Charlopeau (5 Dan Aikijutsu, 3 Dan Iaido, 2 Dan Jodo- Chartre), Sensei Francis Durot (4 Dan Aikijutsu, 2 Dan Iaido, 1 Dan Jodo).